Coin collecting for kids and adults alike, can be both fun and educational. A child can learn about history, geography, math and maybe even politics for an older child. And, coin collecting is also for Kids who want to learn patience and appreciation for art and history. You should start by getting your child a good book about coin collecting. Look for books that have lots of pictures and illustrations. 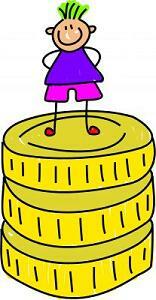 Coin Collecting for Kids is a good one you might consider. You may also want to get some books about different coins from around the world, or one that focuses on the history of coins. If your child is interested in United States coins, you can get a book that is strictly about U.S coins with lots of great history about United States coins. You might also consider subscribing to a coin publication such as 'Coin World' or 'Coinage Magazine' . Your child should also learn about how coins are made. Once they know how coins are made, they will better understand a lot of the coin collecting terms and lingo that go along with the hobby. "Mint Marks" are used on United States coins to identify where that coin was made. This is important to understand because a coin minted at one mint is often of a different value than a coin minted at another mint. They could be alike in every other way and still have a huge difference in value. Coin Grading is another aspect of coin collecting for kids to learn. It will take some time, but your child needs to slowly learn about what coin grading is and how it is done. Eventually they will want to know how to find the value of their coins themselves. Encourage your child by showing an interest in their collection. Take this opportunity to share some quality time with your child by working on the collection together. Arrange your vacation around a trip to visit one of the mints. Help Your Child Decide What Type of Collection They Want. Now it's time to decide what kind of collection your child is interested in. It is probably best for kids to start with a narrow focus so that they don't get frustrated and discouraged. Let your child learn about one aspect of coin collecting at a time. While kids coin collecting can be any and every sort of coin they come across, its easier to collect when they have narrowed down what kinds of coins they want to start with. How to Get Kids Interested in Coin Collecting. There are a lot of things about coin collecting for kids to find interesting. Just giving them a coin collecting guide and a little cardboard coin folder for their birthday or Christmas might spark their interest. You could buy your child some mixed lots of some of the older coins. 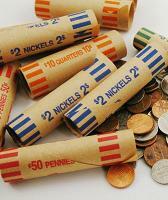 For example, you could buy a few rolls of circulated Buffalo Nickels and a folder to put the coins into. Then show your child how to find the proper place in the folder for each coin. The state quarter program is another idea. These coins can be found fairly easily in everyday use. Just get a folder and show your child how to place the proper coin in the proper place. To see a great video entitled "The Lincoln Penny and The Money Museum" made by kids for kids check out Meet Me At The Corner. While you are there check out the other Virtual Field Trips by Kids. Your child might even want to create and submit their own. Some other coins that work well for the beginner are Wheat Pennies, Indian Head Pennies, Mercury Dimes, Jefferson Nickels and early Roosevelt Dimes. Once you and your child decide on what type of coin is right for them, just be sure to get the corresponding coin folders or albums to display the coins as the rolls are sorted through. Coins from circulation are a great place in coin collecting for kids to start. The monetary risk is low (you can always spend the coins), and they can learn a lot examining the coins carefully and seeing what reference books say about them. These coins would be easy to find. You can just pick some up at your local bank for face value. After your child has sorted through them and kept the ones they want, you can exchange the leftovers at your bank and start the process again. You can also check the spare penny dishes in convenience stores, restuarants, etc. And don't forget to ask friends and relatives to save old or unusual coins for you. Once your child is ready to move on to coins that are more rare and harder to locate, you can start shopping at coin shops, coin shows, and even online. Be sure to check local coin shops for bargain bins. Most will have them and you can find some nice inexpensive coins for a child's collection. This could help your child learn about a budget and making wise choices when purchasing coins for their collection. Handling coins is an important part of coin collecting for kids to learn. Eventually your child will probably want to buy coins that are in reasonably good condition. Learning to handle valuable coins early on can help your child protect their coins and keep them in their best possible condition. They should learn to always wash their hands thoroughly before handling their coins, and avoid touching the surface of coins. Coins should be held by the edges with your thumb and forefinger. Your fingers contain acids and oils that are harmful to the surface of coins. Also place coins on a soft surface when you lay them down and never drag a coin across a table or other hard surface to prevent damaging them. Even small scratches bring down the value of any coin. White Cotton Gloves to keep smudges and fingerprints off of your coins. This might not be critical at first for a child who will only be collecting circulated coins, but starting off doing things correctly can build good habits. Your child will learn the importance of protecting their possessions the proper way. Magnifying Glass for grading your coins and for looking at the fine details of each coin. 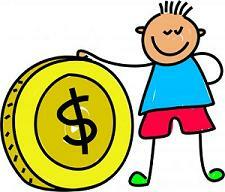 As you go along with your child's new hobby you will find that coin collecting for kids can end up being coin collecting for the whole family. It is fun and rewarding for everyone involved. You could even make it a family project. You could all work on a single collection jointly, or each family member could collect a different coin or a different year of coins. For example, you could each collect coins from your birth year or decade. Then you could get together and have a "show and tell" about each collection. The possibilities are endless. The most important thing about it is the togetherness. Being involved together in a hobby can bring parents (or grandparents) and children closer together. And a coin collection can be passed from one generation to another. As a collection grows older the coins will increase in value and rarity. And finally, remember that coin collecting is for kids of all ages, even 80 year old kids.